Plastic Supplies & Fabrication have been manufacturing displays and stands for clients since 1999. 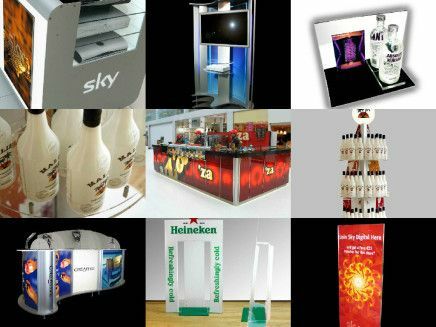 We have worked with some of the biggest names in the business, creating bespoke retail and display solutions. To see some of our recent work, please visit our gallery page. Showcase your brand in the best way possible. When you are showcasing a product, particularly at a launch or event, you want it to look enticing, exciting and you want it to stand out from all the rest. Our bespoke service means that we can come up with a design that suits you. Choose to show one or multiple units to help create a buzz about your product or service. They are strong and durable, so they can be packed up and taken to the next event. POS and POP counter stands and displays. Bespoke fabrications of merchandising and display aids. We have worked with all types of clients, from a small business right up to a multinational company. Whatever the requirement, we work closely with each client to ensure that your pieces are made to the highest standard. Our modern factory has all the latest state of the art equipment, to ensure that your project is completed to a high finish and done as fast as possible.